I’ve worked for the Church as a writer, researcher, and actor. Anytime my teams produced any kind of content—whether we were filming a quick Deseret Industries commercial or writing new material for church curricula—we would be careful to either craft it to meet Correlation standards or frame it in a way that it wouldn’t have to pass by Correlation at all. Correlation was that nitpicky entity that prevented us from completing our projects. Which, in fairness, was entirely unfair. The Correlation Research Division has the all-important role of ensuring the doctrinal accuracy of anything and everything the Church puts out, and I’m sure we’re all grateful that we have gatekeepers to stall doctrinal sloppiness. But however well-meaning and necessary it is, Correlation tends to have the reputation for being a bureaucratic barrier to progress. And yet, it apparently played a pivotal role in bringing about the 2019 changes to the temple ceremony. It was the Correlation Research Division of the Church that distributed emailed surveys in the fall of 2018 to active members of the Church who had not attended the temple in a year in order to ask them about their experience. A research division of the Church struck out to investigate why some people feel they are unwelcome in the House of the Lord. Now, just a handful of months later, those blessed participants’ candid responses have led to changes in the temple ceremony that truly emphasize the reality of our divine nature as sons and daughters of God. And, whether all this started with this outreach or this outreach was merely a step in the process, this outreach happened. Our leaders wanted to better understand our lived experiences in order to make informed decisions about how to lead the Church. So how do they get to call it revelation? Let’s bring Moses into this conversation. Moses began life in a dramatic way. His escape from the death penalty for Hebrew babies, adoption by the daughter of Pharaoh, and subsequent nursing at his own mother’s breast were miraculous, but they were also the result of the careful orchestration of his mother and clever sister, Miriam. These experiences didn’t set Moses apart as a prophet. According to our account in Exodus, the first event in Moses’s life that was both dramatic and divine was his interaction with a burning bush. From that interaction with Deity, Moses received direct revelation and clear instructions. His first revelation came to him literally ablaze in glory. Moses belongs in this discussion because of how ridiculously abnormal this form of revelation was and still is. The burning bush was bright, was undeniable, and man, does it make for a cinematic experience. But it’s not the method of communication that God typically uses. In fact, God has explicitly asked us to expect to receive knowledge “line upon line, precept upon precept.” We have been told to “study it out in [our] mind” when we have a question before even petitioning Him. Recent counsel from church leaders has compared the styles of revelation to the sudden flipping of a light switch and the gradual rising of the sun. If we are subject to these processes of gaining knowledge from the Lord, then why wouldn’t our leaders be, too? Moses essentially wandered into his miraculous experience on Mount Horeb. But that doesn’t seem to be the pattern for common revelation. If we are to study out our ideas before coming to the Lord with questions, then common revelation must be dependent on having ideas to study out in the first place. Common revelation requires context. Perhaps hearing that some people were uncomfortable with elements of the temple endowment was the impetus for the leaders of the LDS Church to begin to study it out—which, in their case, meant gathering context through surveys and interviews from disenchanted saints through the Correlation Division. Perhaps common, non-bush-burning revelation is a mundane process that combines learning and seeking confirmation. It is not my nor anyone’s place to dictate how individuals should feel about recent changes to the temple ceremonies. But may I suggest these changes have indirectly shed light on the process of revelation? Revelation is rarely a bush aflame; often, it seems to be the result of studied, informed effort accompanied by a quiet confirmation from divinity that we’re on the right track. And if that’s true even for the leaders of God’s kingdom on earth, then how great must our responsibility be to speak up about our own experiences. I’d like to kiss the palms of every person who participated in that survey that lead to the revelation of the current temple changes. Our perspectives matter, and it may just be our responsibility to contribute to the process of revelation by sharing them. Miriam lives in Madison, Wisconsin, where she’s always looking for excuses to talk and write about theology, human communication, social policy, and social impact entrepreneurship. What a marvelous insight, thank you for sharing. Loved this! Thank you so much for sharing your insight. It helped me a lot. I have received several surveys from the Church but I did not get that one. And, I wondered if when they were scanning our recommends if they were keeping track of who is attending the temple and who is not. When I ask about it I am told no, that is to just make sure it is actually a current recommend. I have really been struggling with how this whole thing was handled. I love the changes, and am so very grateful for them, but the way it was done just angers me. I felt like they just snuck it in and pretty much gave us women the standard shut up, sit down, and be quiet that we get so much as women. I feel like it would have meant so much if they had said something like: Thank you for bringing your struggles to us, and as we have sought counsel from God we have heard you and the Lord has instructed us on these monumental changes. Instead, I felt like they just wanted to downplay it at all cost. I hate the surveys. You can’t ask for input on one hand, and excommunicate people who feel passionately enough about troubling issues to speak out on the other. Rob: I agree. “Don’t give me your opinion unless I ask for it” is not revelation. Miriam, thank you for the post. Please, maybe I missed this in the article but can you explain how do you know the survey led — directly or indirectly — to the changes? 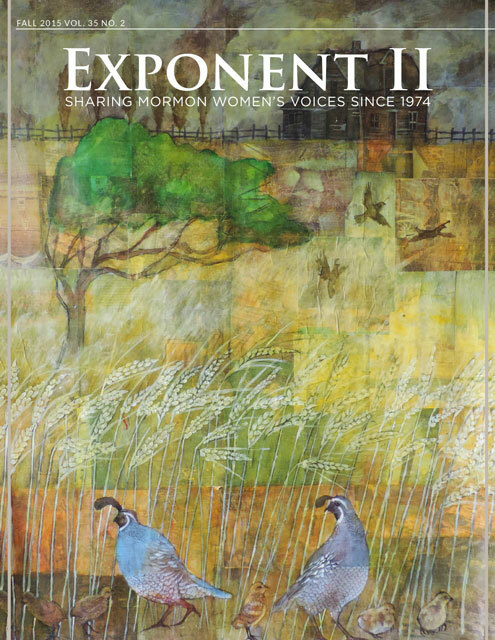 I found posts about it in forums–including the Exponent II Facebook discussion group. Women said they were contacted in the way I described and they posted screenshots of the questions. So well said. Thank you so much. Interesting, I have never received a survey and my recommend lapsed about 2 years ago. I can say that the scanning of the recommends does track who is attending the temple. I watched my Stake President checking the stake stats based on that information and he explained what he was doing before he met with me. I have also never been solicited to participate in a survey. Wonder how they decide who is asked to participate. Sadly, these great changes come without acknowledgement of the harm caused by the ceremony prior to these changes. As I age I find a good portion of sorrow mixed in to my religious belief system. A one-on-one faith (between me and my God) seems the only way forward. While that is beautiful and cannot be taken from me, I miss the sense of a supportive culture I used to feel through the church. No, actually you may not. I don’t know the language that was used in the alleged “survey,” but I can guarantee it did not contain verbiage on the sacred endowment. And neither should your speculative article. What you’re doing here is entirely inappropriate. We are counseled not to discus even ‘the fact’ of the changes outside the walls of the temple. Your theory-making suggests that the endowment is subject to public opinion, which is patent nonsense — your Church employment notwithstanding. Please note the critical, apostate-scented feedback comments you are receiving. I am willing to admit that research and studying-it-out should often preceded revelation, but again, that should not be confused with ideas formed solely by brainstorming. Those are not the same, and anyone schooled in the gospel should know that. To state or imply that God changes his mind based upon mortal opinions is brain rot. We do know though, that as the affairs of people change, God has given revised instructions. Possible example: Swaths of Church membership are influenced by toxic social movements, so to allay resentments from the five foolish virgin members, He softens His Temple Endowment. That in itself is speculative, however, God is not ‘influenced.’ Neither do the Brethren pander to public opinion polls. Your article is not appropriate, and smacks of apostasy. …and people like you are a big reason women leave. I wonder if patriarchal organizations are still as much fun when there are no women to boss around. Looks like church leaders maybe don’t want to find that out. Men leave, too, when put upon in that tone. Glen, you are absolutely out of line in this comment, and breaking a number of our comment policies. You are now placed in moderation. You are not welcome to come into our sacred space and cast dispersions of unrighteousness or apostasy on our authors. Hi there, Glen. I won’t apologize for my article because it came from a place of powerful spiritual learning for me, and that fact doesn’t necessitate that it be powerful or even meaningful for you. I do want to point out that I never implied that God changes his mind based on human opinion. That WOULD smack of apostasy. My emphasis on context should clarify that: God knows exactly how He wants His kindgom to progress, and He depends on His servants to communicate the process of that progression. My suggestion was that God may wait to communicate steps of that progression until His servants and the leaders of the church have undergone the same searching and learning process that we all undergo as part of seeking revelation. I hope you have an uplifting Sabbath. It’s very reasonable prophets would like to receive revelation in keeping with the 9th Article of Faith’s promise that God “will yet reveal many great and important things pertaining to the Kingdom of God”. Maybe, however, it is difficult for them to move ahead in order “to allay resentments” with recalcitrant members who don’t like change. The prophets may understand Moses’s disappointment when he brought down the higher law but the people refused it. One day women will be ordained. Is your reaction to complain to Moses about this prophecy or are you willing to prepare for its fulfillment? Thank you for this! I was so excited about the changes, then read how others were angry and felt like maybe I was wrong for being excited. I had to leave all articles and forums about this topic because my excitement wasn’t welcome. I couldn’t go to the temple because of anxiety, feelings of shame, and feeling really out of place. But after the changes I decided to give it a try. And I’ve been back a second time since then, hungry for more (for the first time ever I actually want to go back). Revelation is not fortune telling. I struggled deeply with the temple and went to my Bishop about it. Cried to the Lord about it. And I feel like all the pain was acknowledged with my changes. The Lord could have changed things without a survey. But because of the research that went in to it, I think leaders now have an entirely new level of understanding of our struggles. For me, it would have been so much worse if it just changed without an attempt to understand. But that’s just me.